This is a guest post by Eliza Perry, one of our Hubbard Fellows. 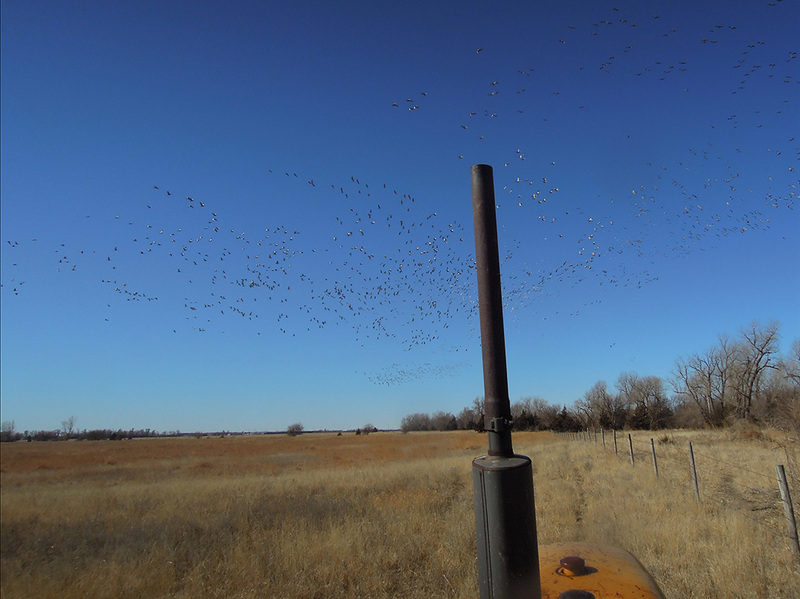 After a few months with very little fresh air, we have been busy getting ready for the crane and burn seasons here on the Platte. Anne and I have been trucking along with our research project reports, but I’m thrilled to be using my body again. We have been learning and hearing about the crane migration and spring burns for nine months now, and they are both finally here! I thought I’d share what we’ve been doing to prepare for these events. Anne takes down old weathered burlap off the front of a blind. 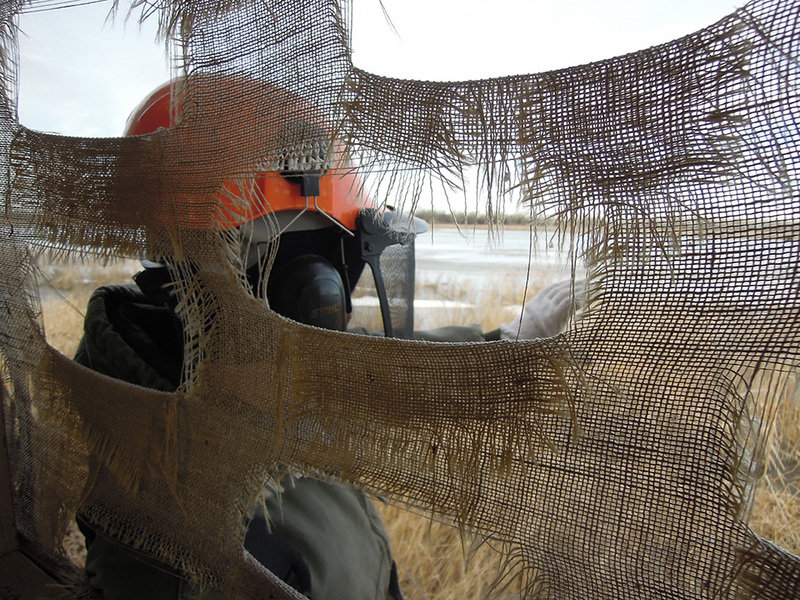 We cover the outside of the blinds with burlap and cut peepholes at different heights so that we can watch the birds without them knowing. Photo by Eliza. 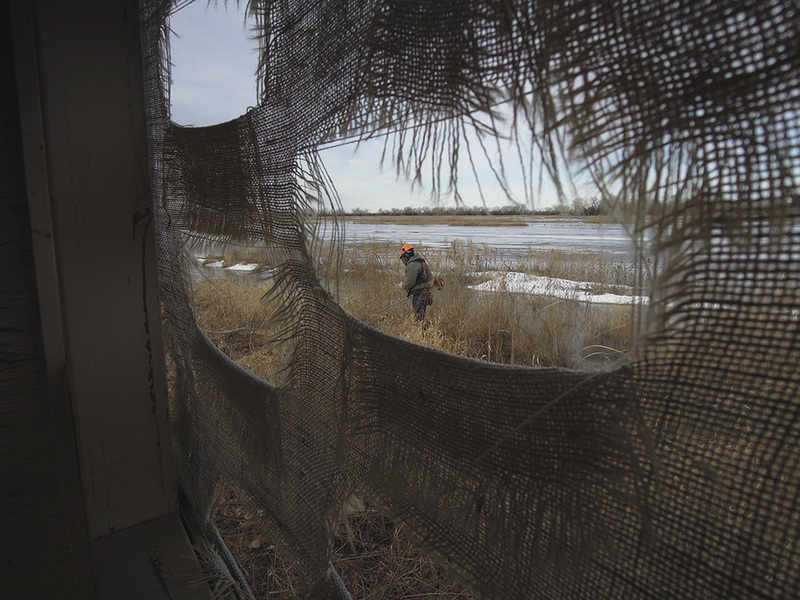 Nelson shows me that to get the best views, we need to cut all of the vegetation that can be seen from any angle inside the blind. Photo by Eliza. We used a beaver blade (weed whacker with a saw blade on the bottom) to cut down the vegetation in front of the blinds. Photo by Eliza. 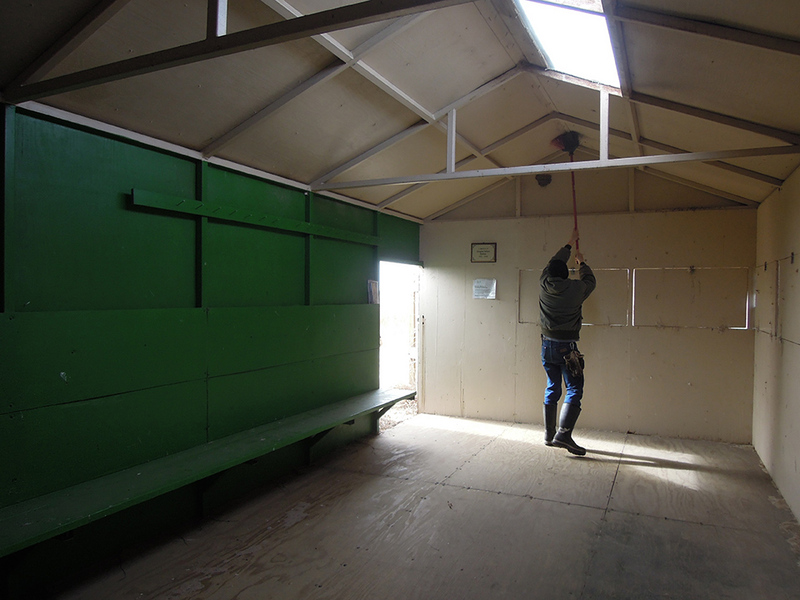 Nelson sweeps cobwebs, bird poo and old nests off of the blind interior. Photo by Eliza. Burn breaks are essential for conducting prescribed fires. We mow a 20ft swath around each burn unit and then rake these areas to keep fires contained and away from property lines. By mowing and raking, we are removing the majority of fuels that a fire needs to burn, which allows us to control where and how the fire moves. I went to mow our Miller property and encountered thousands of cranes getting their protein fix from insects and earthworms right inside of our burn unit. We decided to continue with our work anyway. The birds lifted off right in front of me. Photo by Eliza. 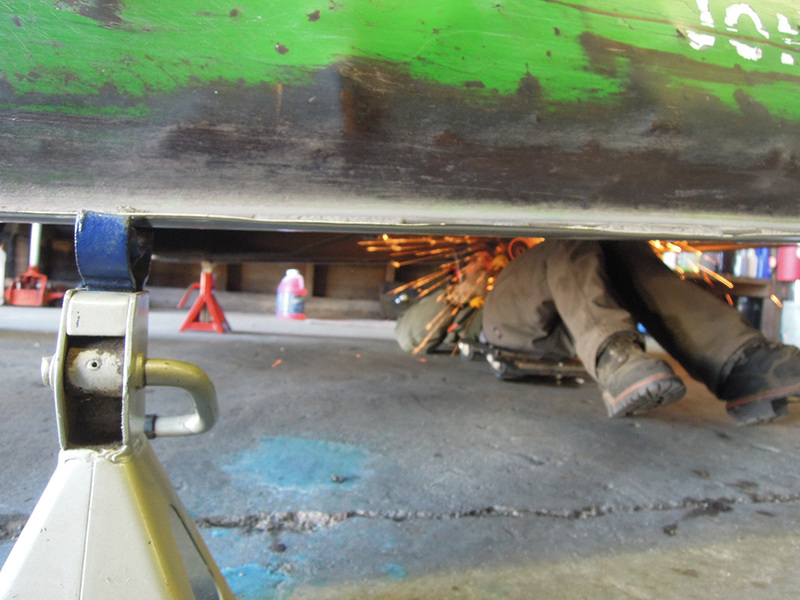 Nelson sharpens the blades on the shredder after several days of mowing. Photo by Eliza. 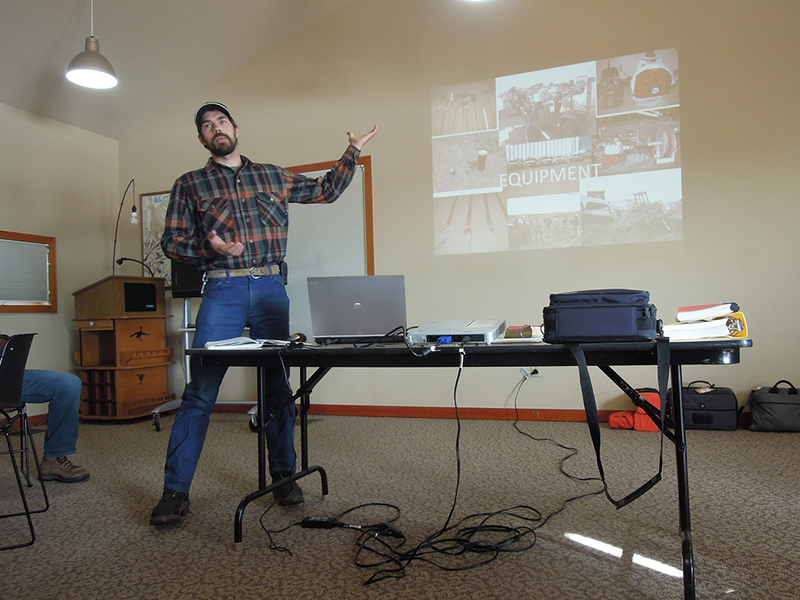 Land management professionals from various agencies and organizations got together at the Whooping Crane Trust for an annual fire refresher course. In this photo, Nelson is giving a presentation on fire equipment and safety. Photo by Eliza. Everybody practiced deploying a fire shelter. Fire shelters are a last resort for surviving intense radiant or convective heat in an entrapment situation when a fire becomes inescapable. 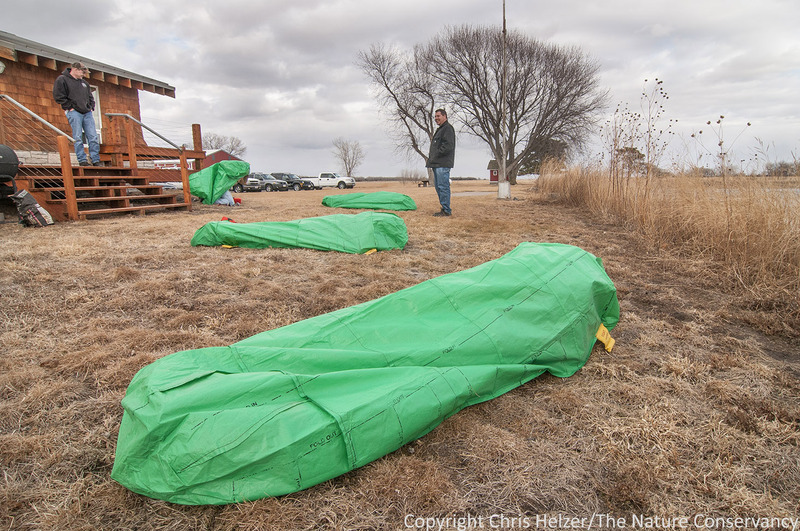 Actual fire shelters are made with layers of aluminum foil and fiberglass, but they can each be used only once so these green tarp replicas are used during trainings. Photo by Chris Helzer. 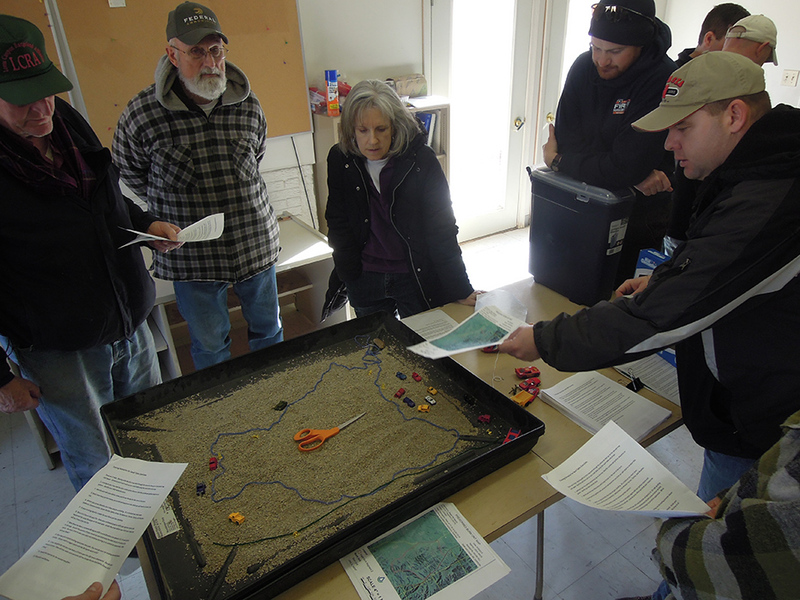 We also participated in sand table exercises, in which a moderator gives a team of professionals with different levels of field experience a burn plan and written scenarios to work through by constructing a burn unit on the sand table, given different variables (wind direction, terrain, etc.). It was really helpful for newbies like Anne and I to work with more seasoned firefighters to learn how to respond safely to various conditions. Photo by Eliza. In order to complete the certification for becoming a Type 2 firefighter, we had to pass either the “arduous” or “moderate” pack test, which involves walking 3 miles in under 45 minutes carrying 45lbs or walking 2 miles in under 30 minutes carrying 25lbs (respectively). 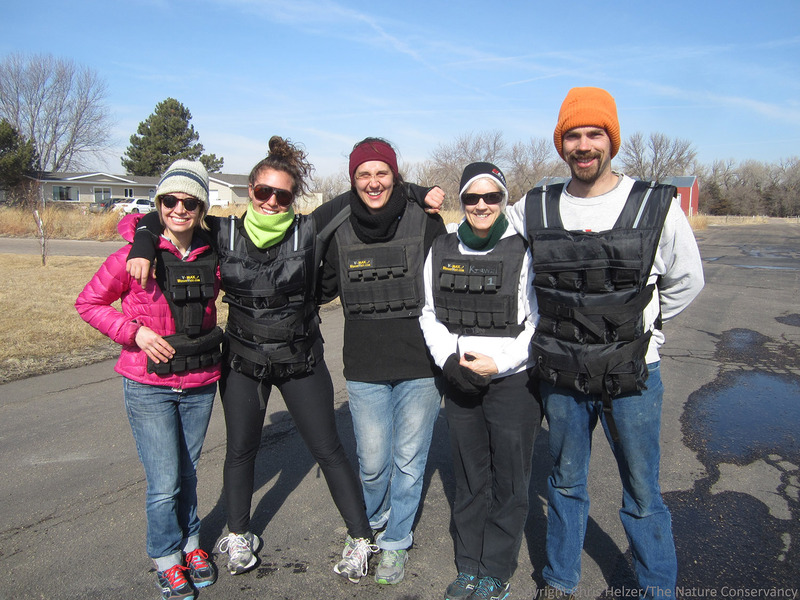 We wore weight vests to distribute the weight evenly on our upper bodies. It was great team bonding, but most of us were pretty sore the next day. From right to left, Anne Stine, Eliza Perry, volunteer firefighter Anne Troyer, Mardell Jasnowski and Nelson Winkel. Photo by Chris Helzer. 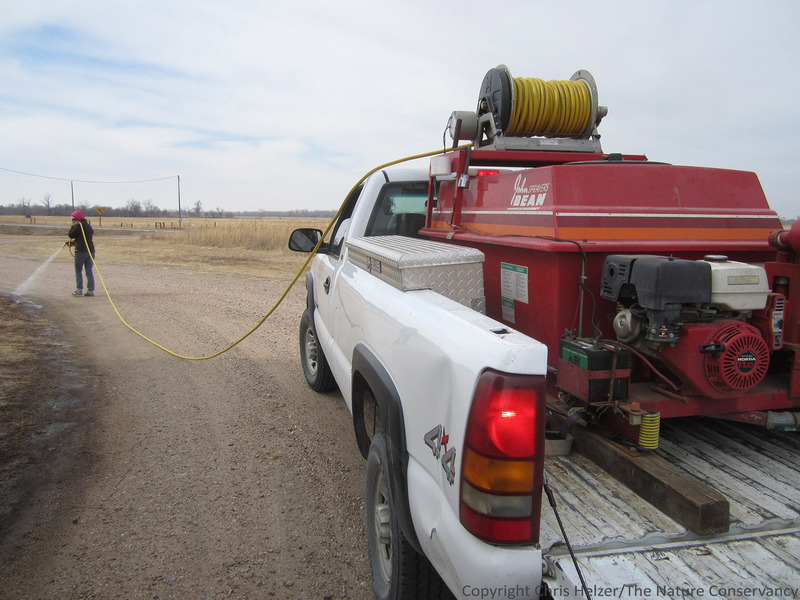 The Platte River Prairies crew hosted our own field day to practice using each of the hand tools and slip-on water pumps before we begin burning regularly. We learned techniques for laying wet lines and mopping up using both the truck and ATVs. Laying a wet line refers to spraying water (or foam or other fire retardant) ahead of the igniter along the inside of the burn break for an extra layer of protection; mopping up in this case means following behind the igniter and making sure the fire does not cross into the burn break. We will also need to master backing up ATVs with 200 gallons of water in tow. Here, Anne lays a wet line and I’m trying to stay at an appropriate distance in the truck. Photo by Chris Helzer. I HAVE NEVER SEEN ANYTHING LIKE THIS IN MY WHOLE LIFE. It is absolutely breathtaking to see and hear thousands of these beautiful creatures all together. 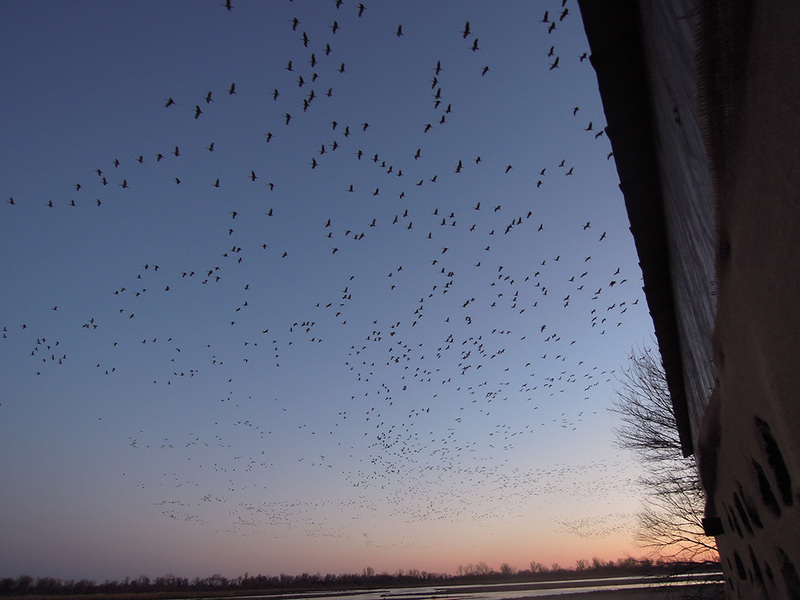 I have been leading tours most nights and a few mornings this past week, and on three of these occasions the birds were right in front of our blind. I found that I really enjoy watching the antics of just one bird at a time, bending gracefully to poke around in the sand or within their feathers. Their gait and coloring give them an especially regal appearance. They strut around among their companions and make the most beautiful racket I’ve ever heard. 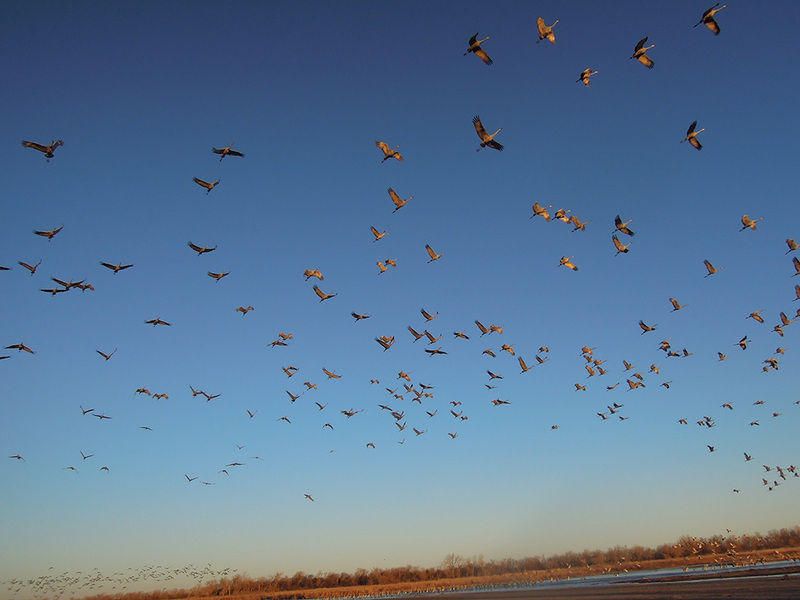 Several Nebraskans have told me crane calls signify spring to them. I like that much better than mud, the only indication of spring in Maine. Check out Anne Stine’s recent post for a more in-depth description of her crane viewing experiences. Photo by Eliza. A slightly crooked shot by Eliza. 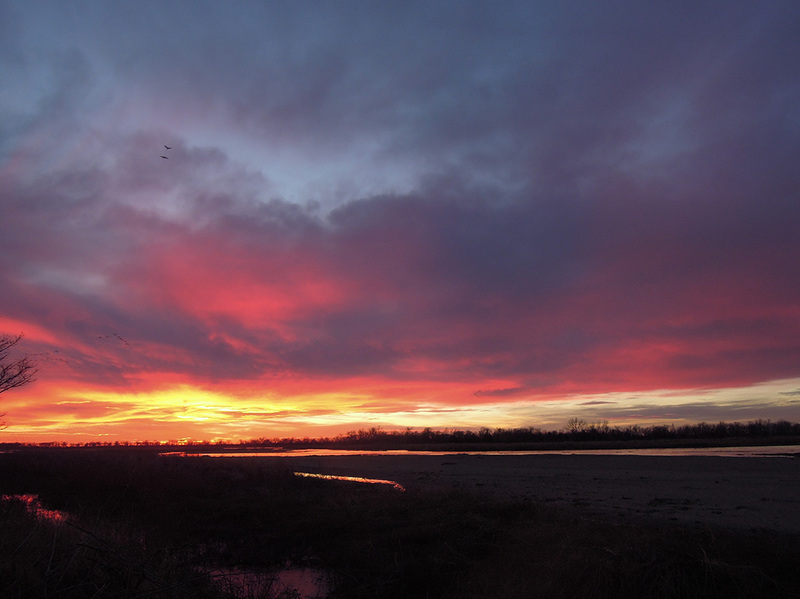 Sunset over the Platte River. Photo by Eliza. 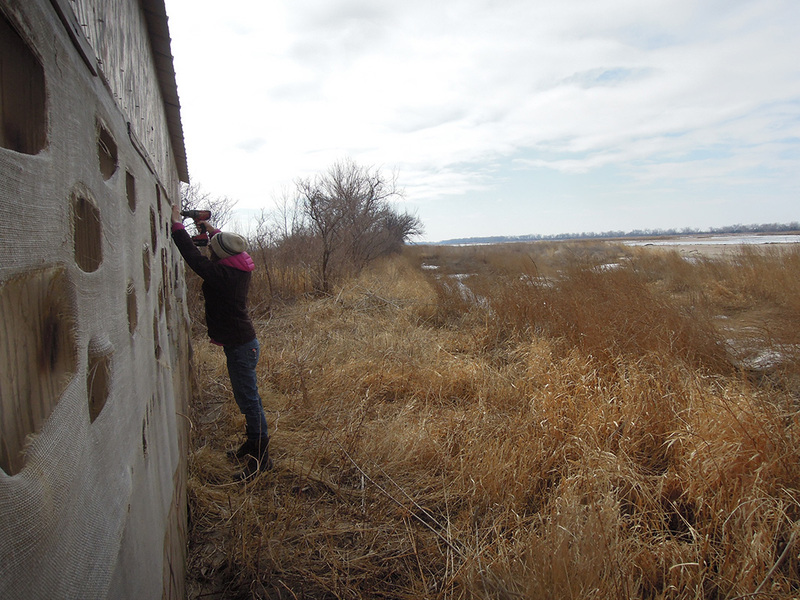 This entry was posted in General, Prairie Photography and tagged blog, eliza perry, hubbard fellows, hubbard fellowship, nebraska, platte river, platte river prairies, sandhill cranes, the nature conservancy by Chris Helzer. Bookmark the permalink. That “beaver blade” weed whacker sounds scary! Love the pictures. Although I’ll never participate in a prairie burn, I appreciate having the opportunity to understand more about the process. Thanks for all the education I get from this site, Chris!